The idea for a break-through product like Mirage was obvious. We at DINAX have been producing optimized professional level output on digital based inkjet printing systems since 1993. Mirage is developed, optimised and used by photographers, fine art printers, print service providers, graphic designers, marketing agencies, layout designers, packaging designers and professional amateurs. Mirage offers professional and “Prosumer” functionality, all at a cost-effective price point. 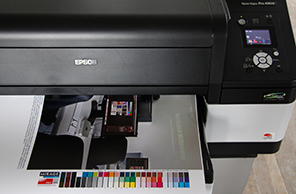 Mirage sets milestones, defining new levels in print quality, ease of use and productivity. The intuitive user-interface enables you to work fast and efficiently. As native plug-in Mirage offers everything, as it should be; smooth and perfectly scaled gradients, fonts and embedded vector graphics. Download Mirage and try it for 14 days. The intuitive Mirage user-interface enables you to work fast and efficiently. As native plug-in Mirage offers everything, as it should be: smooth and perfectly scaled gradients, fonts and embedded vector graphics. Mirage comes as plug-in for: Adobe™ Photoshop™, Adobe™ Photoshop™ Elements, Adobe™ InDesign™, Adobe™ Illustrator™ and Adobe ™ Lightroom or as a stand-alone droplet based application. There are no hidden costs for different printer sizes; Mirage allows printing to multiple printers at the same time. Last but not least; We offer a very fair price policy when it comes to upgrades and cross-grades. Mirage‘s modular extensions are a cost-effective approach to expanding its functionality. * This can only be achieved, if the monitor is correctly calibrated and corresponds with the current ICC printer profiles in use. The Mirage Jobs-Archive enables you to manage already processed jobs perfectly. By simply pressing the Print button, all Jobs stored within the archive can be printed again at any time. The Mirage Jobs Archive is ideal not only for an uncomplicated reprint, for example of editions of your works, it also allows you, as a Print Service Provider, to make test prints for customers and recreate those prints after his final approval in any quantity requested. Color Management - Easy as never before! The Mirage PRO- Extensions will give you full control over the color management of your files. Create your individual ICC profile with the help of the Pro-Extension and the optional built in Spectralphotometer.